Home/Uncategorized/Is Your Business Plagued By Pest Bird Control Issues? IPM has provided a wide range of successful commercial bird control services to business owners throughout the South East of England. A major problem for businesses and in particular businesses in urban areas is the damage caused by pest birds. Many other pest control companies offer bird control techniques that due to lack of understanding will not provide the desired results. However, this is not the case with the IPM team. It is important to understand that because birds are living creatures, they will naturally adapt over time to circumvent prevention measures which are not correctly implemented. 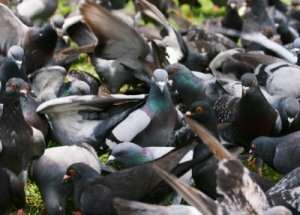 As with other biologically based building problems, the control of pests such as pigeons requires the application of a continuing strategy of measures to control the combination of environmental factors which favour their activities. To ensure that our team of expert technicians provide the right solution, they will complete a thorough survey of the area to ascertain which course of action will be most beneficial, once completed they have a range of different methods from which they can choose. Spring wire, point prevention and bird netting are just some of the humane bird prevention options available in regard to the effective pest control of birds each with their own particular benefits. Spring Wire: An extremely versatile solution which can be installed anywhere on the outside of your property including window ledges, beams, gutters, pipes, signs, roof ridges and rails. Point Prevention: Works by upright wires (or points) attached to a stabilised base that is usually glued to the surface with a silicone adhesive or other suitable fixings. Sometimes referred to as bird spikes, these points make it extremely uncomfortable and even impossible birds to land on the surface. Bird Netting: One of the most effective and commonly used methods for preventing birds from roosting in urban areas. If installed well, bird netting can last a long time and also appear almost invisible from the ground.